Reflexes are fascinating. These hard-wired, evoked responses are the result of millions of years of evolution and development. But how are they different from a reaction? How fast exactly is a reflex? 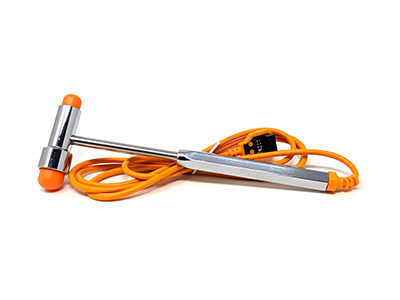 The Reflex Hammer allows you to record exactly how fast your reflexes are. Take, for example, the Patellar Reflex: The Hammer's built-in accelerometer will put a marker into your recording the instant the hammer strikes your subject, while the Muscle SpikerBox Pro records from your quadriceps, capturing the EMG from your muscles the instant they contract in response to the reflex. Then, you can measure the time difference between when the hammer struck and the muscles contracted in response, giving you the exact speed of the reflex arc! This kit is a great alternative to the tools recommended for the Patellar Reflex lab featured in Human Body Systems' lesson "2.2.4 It's All in the Reflexes." Everything comes pre-assembled (No rubber bands required,) and it pairs with our free, user friendly software: SpikeRecorder (which is available on any smart device.) Even better, the accelerometer and muscle activity will appear on the same screen - no need to compare time-stamps between separate recordings! To see just how simple it is to use, check out the Patellar Reflex Experiment! If you purchased your Muscle SpikerBox Pro before Feb 2019, you will need to update the firmware by following this guide. LATEX FREE: the hammer's heads are made of sillicone. Doctors Agree: Quite a good Thwacker! Not Recommended for hammering nails.